Founding member Jane Vidrine once described them as "Women's voices in harmony, hitting the chords that haven't been heard in Cajun music before." One of the few all-woman Cajun bands in existence, the Magnolia Sisters play the standard elegant waltzes and snappy two-steps with energy, verve, and a playful flair. Yet their sound adds a further dimension to the mostly male-dominated genre of Cajun music, featuring tight, soulful harmonies and a distinctly older Cajun swing style. Renowned folklorists as well as amazing musicians, the sisters have also resurrected rare ballads and stirring folk tunes sung a cappella, giving the listener a taste of a woman's life on the bayou. The quartet features Ann Savoy (who also performs in the Savoy-Doucet Band and Savoy Family Band) on accordion, fiddle, and guitar, Jane Vidrine on fiddle and guitar, Lisa Trahan on bass and accordion, and Anya Burgess on guitar and fiddle. All four contribute to the great vocal mix. 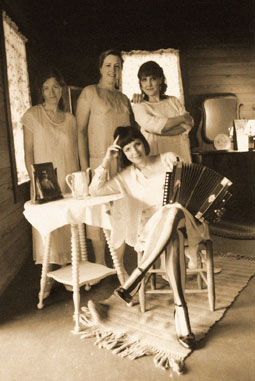 The Sisters' most recent CD, Stripped Down, was nominated for a Grammy Award this year for Best Cajun/Zydeco Album. Come check them out!